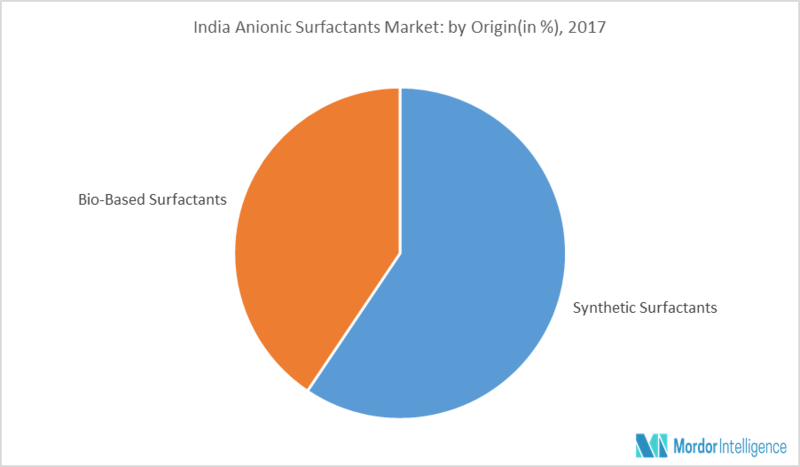 The India and China anionic surfactants market is estimated to grow at a significant CAGR during the forecast period (2018 - 2023). The soaps and detergent application segment is expected to hold the largest market share. Synthetic surfactants are traditionally produced from petroleum-based substrates and are widely used in different application segments, such as detergents & cleaners, auxiliaries for textiles, personal care, industrial & institutional cleaning, and paints & coatings. Anionic surfactants form a separate class of surfactants chemicals, and they find use in a wide variety of key applications. Anionic surfactants carry a negative charge but are made up of a negatively charged alkyl portion along with a positively charged cation. They are classified as commodity products due to the minimal product differentiation, low price margins, and large volume production. This aforementioned activity has existed over a decade, and the market pressures, such as raw materials and production costs, are pushing the need for more specialized and technically superior varieties. The household detergent market includes laundry detergents, dishwasher detergents, prespotters, carpet cleaners, and fabric softeners. This segment consumes almost half of the total surfactant demand of the Chinese and Indian market. For laundry detergents, the primary function of a surfactant is to remove soil from fabrics and to suspend the soil in the wash water. Fabric softeners are either added to the final rinse or as dryer sheets which are used to dry the wet clothes in dryers. Surfactants in dishwasher detergents are used for wetting surfaces to help soil removal. The major surfactants used for the purpose include LAS and ethoxysulfates. Major Players: Reliance, IOCL, Nirma, and Galaxy Surfactants, among others.